I will introduce Japanese sculptures designated as National Treasure. All the sculptures of National Treasure are related to Buddhism and Shintoism (Most of them are of Buddhism). 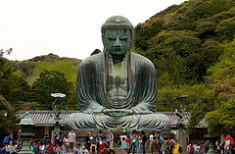 all the works were made until Kamakura era (12-14th century). I will show you several points to appreciate Buddhist sculpture. Nyorai, which means 'the one who came from the truth', is the being who reached the highest Buddhahood. Followings are the kinds of Nyorai. 'Amidanyorai': He used to be a prince of India but became Nyorai after ascetic training. 'Birushanabutsu': It represents Buddhism itself. 'Dainichinyorai': Highest being in Buddhist Tantrism. Bosatsu, which means 'the one who seeks for enlightenment', is the disciplinant who performs ascetic training in order to become Buddha. Followings are the kinds of Bosatsu. 'Kannon bosatsu': He (She) listens to people's sufferings and saves everyone. 'Juichimen kannon': He (She) has 11 heads and watch every direction to save everyone who suffers. 'Miroku bosatsu': He will appear after 5,670 million years after Buddha's death to save people. 'Senju kannon': He (She) has 1,000 hands and eyes and saves human and living nature with unlimited mercy. Myouo is a kind of Buddha who appeared to eliminate evil heart and save humann and living nature, so his face is thunder look. Followings are the kinds of Myouo. 'Fudo myouo': He acts by the order of Dainichinyorai. He has the most powerful and has biggest merit among other Myouo. This statue is enshrined in the middle of 5 Big Myouo. 'Gozanze myouo': He suppresses 3 foul passions (hogging, anger and ignorance) in past, present and future. 'Aizen myouo': He changes the sexual desire of human to the heart which seeks for enlightenment. The body color is red which represent sexual desire. He has bow and arrow at hand and lion on his head. Tembu are Gods who became believers of Buddhism. They protect people from the enemies who try to discourage from Buddhism belief. Followings are the kinds of Tembu. 'Bonten': Brahma, the God of creation in Hindu, was introduced to Buddhism. He is in one of the highest positions among Tembu. 'Taishakuten': The root is the God of thunder in Indian mythology. He is the God of war wearing armor. He is also in high position. 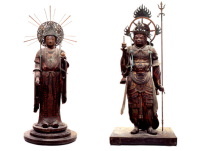 'Shitenno': Four Gods who gard 4 directions to protect Nyorai and Bosatsu, east (Jikokuten), south (Zochoten), west (Komokuten) and north (Tamonten). The statues is dynamic wearing armor and stepping on the devil. 'Bishamonten': The another name of Tamonten, one of Shitenno who gards north. His wife is Kisshoten. 'Kisshoten': Daughter of Kishimojin and wife of Bishamonten. Goddess for peace, fertility and fulfilling treasure. She has a rosary which grants all kinds of wish on her left hand. 'Benzaiten': Goddess of water. The sacred river in India was apotheosized. She gives wealth, foods and descendants to the ordinary people. 'Daikokuten': He originally was the God of war. One of 7 Gods. He sits on the rock holding bag and treasure wand, or stands wearing hunting clothes and holding bag. 'Emmao': The first dead who went into underworld. He became the a ruler in the underworld and judge people by their sin in life. He has fierce look and holds dipper in his right hand. 'Suijakushin' (by the syncretization of Shinto with Buddhism), 'Rakan' (disciple of Shakanyorai), 'Shotoku Taishi', 'Kobo Daishi', founder and hierarch like 'Nichiren' and so on. 90% of Buddhist statue designated as national Treasure is made of wood. The oldest material is camphor laurel. Japanese cypress, Japanese natmeg, Japanese Judas tree, cherry tree, pine tree, mangolia obovata, cypress sandalwood are also used. 1. Ichibokuzukuri: Use only one piece of wood from head to the body. 2. Yosegizukuri: Combine more than two pieces of woods. To avoid dry and crack and make it light, they hollow out the back and cover with the other material. After cutting, one way is to apply the woodgraining without painting. The other way is to out gold leaf or paint after lacquering. As stone is strong against rain and wind, it was used to make the outdoor statues. It is called Stone Buddha. One way is to use the natural stone and the other way is to use the cut stone. By the form of cut Buddha, there are 'whole body', 'relief' and 'line cutting'. Granite is most used because it is hard, dense and long-lasting. Copper is the most used material, but gold, silver and iron are also used. In every case, shape the statue by putting the melted metal in the mold. Mold is made with wax, soil or wood. When they use wax, put the beeswax on the soil and shape. Then cover with the soil and burn to melt away the beeswax. Then pour the melted copper in the space where wax was filled. In many cases, copper statue is guilded and called 'Gold copper Buddha'. Clay is used. There are 3 types. 1. Sozo: Attach the clay on the core wood. Delicate expression is possible. It is heavy and weak against water and sunshine. 2. Senbutsu: Put clay in the mold and make it dry in the shade, then burn in the kiln. Finish with laquering, gilding or coloring on the surface. This technique is well used to make relief. 3. Kawarabutsu: To make the whole body with clay. They burn in the kiln. This technique is used to make small statue. Sap of Japanese lacquer tree is used. There are 2 ways. 1. Hollow dry lacquer method: Make the master form by the soil. Then paste the cloth by lacquer in stratum. After it become dry, take out the soil and strengthen with the wooden frame. 2. Wood-core dry lacquer method: Put the lacquer thickly on the wood core. In both cases, the surface of the statue is colored. Open the head of statue and fix the crystal or glass made eyes from the back. They make the statue as if it is really alive. Most of the National Treasures are Buddhist statues and the other things are also related to Buddhism.